The Latest News is that Rajasthan Public Service Commission (RPSC) has release Final result / List of selected candidates based on the performance in written examination, PST/ PET and interview for 361 posts of Sub Inspector Police (AP) and 34 posts of Platoon commander (S.I. R.A.C.) on pay scale Rs. 9300-34800/- Grade Pay Rs. 3600/- in police department. 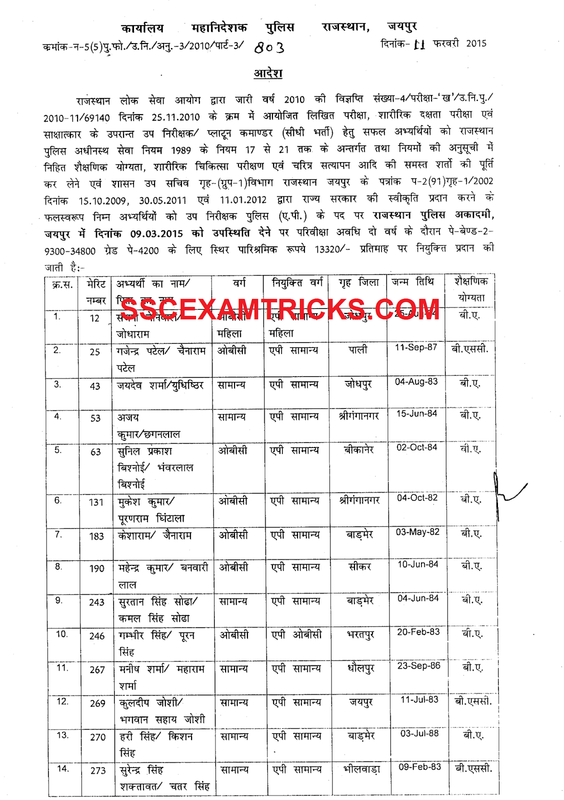 RPSC Final Merit List includes merit number, name of candidate, father name, category of candidate, home district, date of birth and academic education. RPSC has also released agreement letter for Finally selected candidates which is required to be submitting duly filled at the time of joining. The Joining Date for Finally selected candidates is 09th March 2015 for both posts. It is advised to the finally selected candidate to bring certain documents at the time of getting appointment letter / Joining for the posts. Earlier RPSC had released notification advertisement no. for the recruitment of 395 posts of Sub Inspector Police (AP) and Platoon Commander (S.I. R.A.C.). The last date of the notification was 31st December 2010. A huge number of candidates had appeared in the written examination. The qualified candidates of written examination were called for PET/ PST and short listed candidates were attended interview for the posts. Those candidates who had appeared in the interview and waiting for final result can download their result from the direct link provided in the end of the posts. The RPSC SI Exam was conducted by Pen MODE. The OMR sheet was filled by Blue/Black ball point pen. The exam consisted of various sections English, Math, History Geography Civics and General Awareness. The exam was a multiple choice question paper of 100 questions of 100 marks and four options are provided out of which candidates need to choose one correct answer. The Written Exam level was Up to 10th Standard. The time duration was of 2 hours or 120 minutes. Physical Standard Test (PST) and Physical Eligibility Test (PET) were conducted to measure the physical standard requirement of the candidates. The physical measurement of candidates was made by RPSC official/ duty officers. The qualified candidates were called for written examination for the post of Police Constable. Selected candidates were required to bring computer generated result print, original documents (10th, DMC, Cast certificate –If applicable etc.) and one set of self-attested of all the documents to the venue of interview. Candidates were required to bring 10th Certificate for Age Proof and at least one Address proof i.e. PAN Card, Ration Card, Aadhar Card, Voter card or Driving License. Candidates were required to bring two extra colored recent passport size photograph (same as pasted on computer generated application form) required for application form or other document requirements. Candidates were brought Caste/PWD/EXS certificate to claim for seat available for reserve category. The Finally Selected Candidates for the posts of Police SI should bring and deposit the list of document which is provided below at the time of receiving appointment letter from the authority. The appointment Letter will contain the date of joining and reporting time along with venue of appointment. The candidate will have to report at the venue mentioned in the appointment letter on the fixed date. · Any other Relevant document that candidate mentioned at the time of application for posts.